Last night after walking around Darling Harbour I decided to walk over to The Rocks. 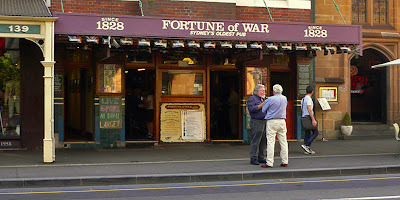 I wanted to have a beer at the Fortune of War. One of the pubs claiming to be Sydney's oldest...says so right on their sign. It's a British style pub, old and friendly. I met a couple of guys there from England and of course a few people from Sydney. After everybody was done buying rounds I left and hopped on a train for Parramatta. About half way home I realized I had left my little camera sitting on the bar. Today I went back thinking my camera was gone for good. But as luck would have it someone turned my camera in and it was there waiting for me. Here's a picture of the Fortune of War I took today. Now when you think of Australia what comes to mind besides kangaroos? 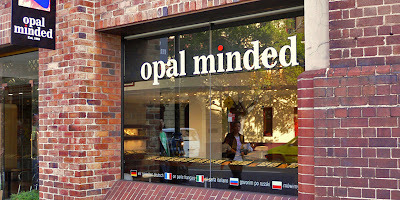 Sydney has many quality opal jewelery shops. I've been in four or five and the opals are amazing. There are three main types of opals, black, white and boulder. The black opals come from NSW. They are the rarest. The boulder opals are mined in Queensland and are quite stunning. The white opals are found in South Australia. If you are looking for opals, this is the place to be. I never really cared for them until now. My favorite are the black opals. I'll look again before going home. Sydney is a great city to walk around in. I'll come back if possible. I'll miss it.